Two of my passions in one blog! 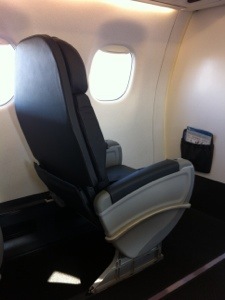 Finally an upgrade to Business Class! Shame it is only a 25 min flight but whose complaining? The configuration is a comfortable 1-2 arrangement and I am in 2D! Minimal seat recline but a very wide pitch in dark grey leather hues. Sure beats the propeller ATR-500 this morning. No pre-take-off champers on this flight; rather the choice of a glass if water or OJ, and friendly, smiling, well groomed attendants instead. No personal audio-visual screens but instead to sink into my fiction novel based around the adventures of the Knights Templar instead. Shock! Horror!! Food service begins almost immediately. Row 1, seats 1, 2, and 3 are offered a choice of Mediterranean vegetables and sliced cured meats or a tomato and onion tart as their choice, BUT the guy next to me and I are offered a Spinach and Ricotta muffin and a glass of wine from Economy. What!? Surely a mistake?? Sadly no, as we were both upgraded, we are declined the business class food service, much to the amusement of 1A who keeps looking over her shoulder and smirking at us. Oh how I want to yell out and say ‘…well my fare was only $95!’ She would have paid at least $450 for pleasure 🙂 but what’s the point? After arriving in Sydney airspace we circle for a good 10 mins before landing due to congestion at the airport. 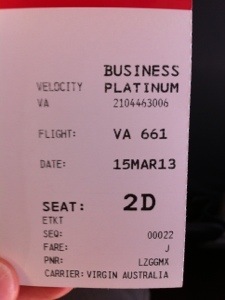 My brief experience flying VA domestic business class has come to an abrupt end. Rating: 6.5/10 (would it kill Virgin to complete the experience with a Business Class meal)? It’s a tongue-in-cheek review, John. Lighten up. It’s actually a harsh score I have in hindsight, but it was years ago. I am sending it to a few buddies aans additionally sharing in delicious. Thank you – glad you enjoy! shared this helpful info with us. Please stay us up to date lik this.